When he was a young man Joe Biden experienced a tragic life event. On December 18, 1972, at age 30, his wife and baby daughter were killed in a car accident. And like all life-changing events – in all lives – it was mapped in his progressed chart and destined by nature for a purpose. Joe – like all human souls – is here to develop feeling and intelligence and the events he experiences contribute to their development. His role in God’s grand evolutionary plan requires a life experience that ensures the development of his one very special talent. And his birthchart maps the talent and the events that contribute to its development. So Joe Biden experienced the tragic death of his wife and young daughter because without it he would never have become the person nature (God) intends. The event contributed to the development of his character and its unique very special natural talent. The tragic accident event involving his wife and their one-year-old daughter (and two sons who survived) provides vital clues regarding the chart’s accuracy. Mars is the accident planet, house 5 rules his children, house 7 rules his wife and house 8 rules death. And for the event to occur all these birthchart markers must be turned on by progression. Progressed Mars (at 3 Sagittarius 26) – the accident planet and cusp ruler of house 5 (his children) – had moved to form a high-discord separation (opposition) aspect with birthchart Uranus in house 6. And progressed Venus (at 6 Capricorn 22) – planet of loved ones – had moved to form an expansion (inconjunct) aspect with birthchart and progressed Pluto (at 6 Leo 03R) in house 8. House 7 (his wife) is high in discord – Saturn is there – so unfortunate ‘loss’ events are scheduled to occur, but at the time of the accident there was no standout progression involving this house. But if he was born before 8.28am Uranus would be there and the discord of the Mars-Uranus opposition would have impacted directly on house 7. Now when a planet changes its house position this alters its astrodyne value so when Uranus moved from house 7 to house 6 at 3.28am its power value dropped, but it remained the dominant planet till 3.32am when the Sun took over. So you can safely say that Joe Biden is a Sun-Uranus person. And between 8.25am and 8.35am – the birth time’s margin of error – all the planets with above average power stayed the same. Uranus in house 6 is the dominant planet. It’s opposition ascendant, trine Neptune, opposition Sun, parallel Saturn, conjunction Saturn, opposition Venus, parallel Jupiter, sextile Pluto, semisextile Moon and parallel Sun. It has a net discord of 9.33 discordynes and aspects all the planets with above average power. They are Sun in 12, Venus in 12, Saturn in 7 and Jupiter in 8. Best planet is Jupiter – then Neptune, Venus, Mercury and Sun. Worst planet is Saturn in 7 – then Uranus, Mars and Moon. Dominant aspect is Uranus in 6 opposition ascendant – then Sun conjunction Venus, Sun parallel Venus, Uranus parallel ascendant and Uranus trine Neptune. Best aspect is Uranus trine Neptune – then Sun trine Jupiter, Jupiter trine Venus and Mercury trine Jupiter. Worst aspect is Uranus opposition ascendant – then Saturn opposition ascendant, Sun opposition Uranus and Jupiter semisquare Saturn. Dominant house is 12 – then 1, 8, 6 and 10. Best house is 12 – then 8, 1 and 4. Worst house is 7 – then 2, 5 and 3. Uranus sign is Gemini – I think – first decanate – Intuition. Sun sign is Scorpio – I Desire – third decanate – Attainment. Moon sign is Taurus – I have – first decanate – Determination. Ascendant sign is Sagittarius – I see – first decanate – Devotion. The chart’s best markers are Jupiter, Scorpio, Uranus trine Neptune and house 12. And its trouble spots are Saturn, Gemini, Uranus opposition ascendant and house 7. 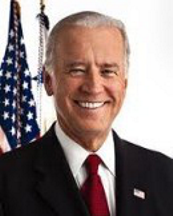 With Uranus and Sun dominating his mental make-up or character Joe Biden is a natural born leader and politician. He has an air of authority (Sun), the capacity to influence and the charisma to convince (Uranus). He began practicing law in 1969 and was a United States Senator from January 3, 1973 until his resignation on January 15, 2009. He was the first Roman Catholic to become Vice-President. He’s been heavily involved in Obama’s decision-making process and his ability to negotiate with Congressional Republicans has played a key role in bringing about bipartisan deals. Following the death of his wife and daughter he raised his young sons – a single father for five years and a senator. It wasn’t easy. He remarried on June 17, 1977. Academically he was undistinguished. But his Sagittarian personality loved to play sports and party and his Neptune has been known to play around with the truth and lie, fib or mis-remember. The Sun in his chart (at 27 Scorpio 33) and the Moon in Mitt Romney’s chart (at 27 Scorpio 37) are in the same degree of the zodiac so they have common mental traits; and he and Paul Ryan have the same decanate of Sagittarius on the ascendant so they have common personality traits. Sun is in the Attainment decanate of Scorpio so he’s got intense emotions and vivid ideas and (just like Mitt Romney) he’s capable of lofty effort for home and country and requires a partner to stimulate his ambitions and ideals. The Moon is in the Determination decanate of Taurus so timidity is a mental defect he has had to overcome. He has natural healing power and the ability to crystallize conditions by the power of his imagination, but there’s a tendency to devote too much time and effort to the acquisition of wealth. And the ascendant is in the Devotion decanate of Sagittarius so he’s very religious, deeply sympathetic and capable of attaining Cosmic Consciousness. He may feel that his being here has a definite purpose and should always rely on his own judgement. Mishap and misfortune invariably result if he takes the advice of others. Barack Obama and Joe Biden have a powerful astrological connection. Obama’s dominant Moon (at 3 Gemini 22) and Biden’s dominant Uranus (at 2 Gemini 46R) are within one degree of a conjunction aspect. Progressed Sun (at 18S05) in house 2 has moved to form an intensity (parallel) aspect with birthchart Mercury in house 12. Progressed Mercury at (28 Capricorn 24R) in house 2 has moved to form an opportunity (sextile) aspect with birthchart Sun in house 12 and progressed MC (at 20S22) in house 12 has moved to form an intensity (parallel) aspect with birthchart Sun. The parallel aspects have a neutral influence and the Sun-Mercury sextile aspect adds harmony to the power (Sun) thought-cells in his unconscious mind. 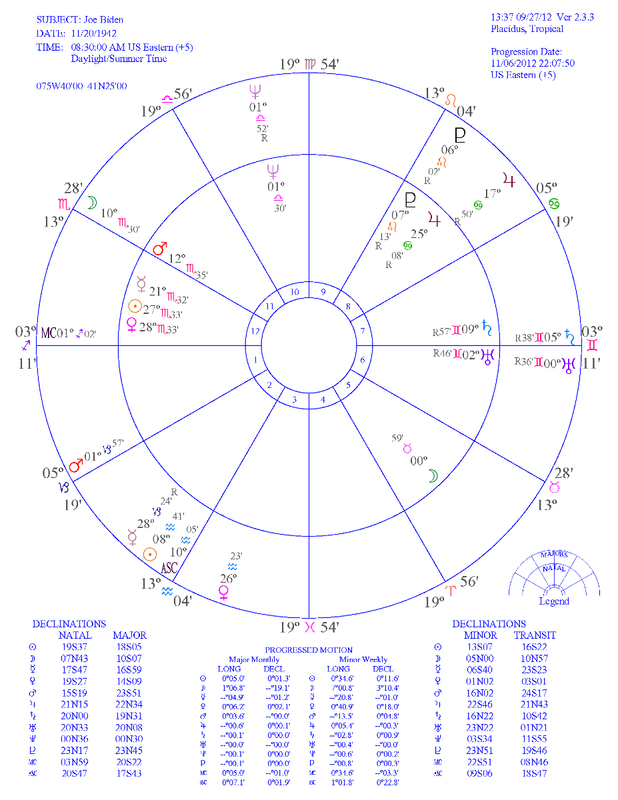 House 10 in Joe Biden’s progressed chart and the progressions involving Neptune, MC and Mercury on November 6, 2012 permit an assessment of the strength and functionality of the thought-cell activity influencing his job and career on election-day. It holds the key to what happens so the progressed chart makes prediction possible. Biden’s tenth house has 34.74 harmodynes and this has translated into a fortunate and successful career. Progressed Uranus is trine (luck) birthchart Neptune in house 10. It adds harmony and luck. And progressed Mars (at 1 Capricorn 57) in house 1 has moved to form obstacle (square) aspects with birthchart and progressed Neptune. These square aspects add discord, but the size of the obstacle is reduced because Neptune is very harmonious. There’s a very harmonious (and fortunate) progressed MC-Neptune sextile aspect, but it depends on a very accurate birth time. Progressed MC (at 20S22) is parallel birthchart Jupiter so it adds harmony; and progressed MC is parallel birthchart Saturn and it adds discord to the tenth house. Progressed Mercury, cusp ruler of house 10 (at 16S59), is parallel birthchart Mercury. It adds power, but no harmony. And progressed Mercury (at 28 Capricorn 24R) in house 2 has moved to form sextile aspects with birthchart Sun and birthchart Venus. These sextile aspects add harmony of the opportunity kind to the tenth house. Progressed Mars (at 1 Capricorn 57) in house 1 has moved to form an expansion (inconjunct) aspect with birthchart Uranus in house 6. There are several aspects involving the ascendant – progressed ascendant is (trine) luck birthchart Saturn – but they depend on an accurate birth time. And progressed Mars has moved to form a luck (trine) aspect with birthchart Moon. This activates their birthchart opposition so the aspect’s harmony is reduced, but it doesn’t influence house 10. So Biden’s progressed Mercury is sextile birthchart Sun and his tenth house is a mix of harmonious and discordant aspects. 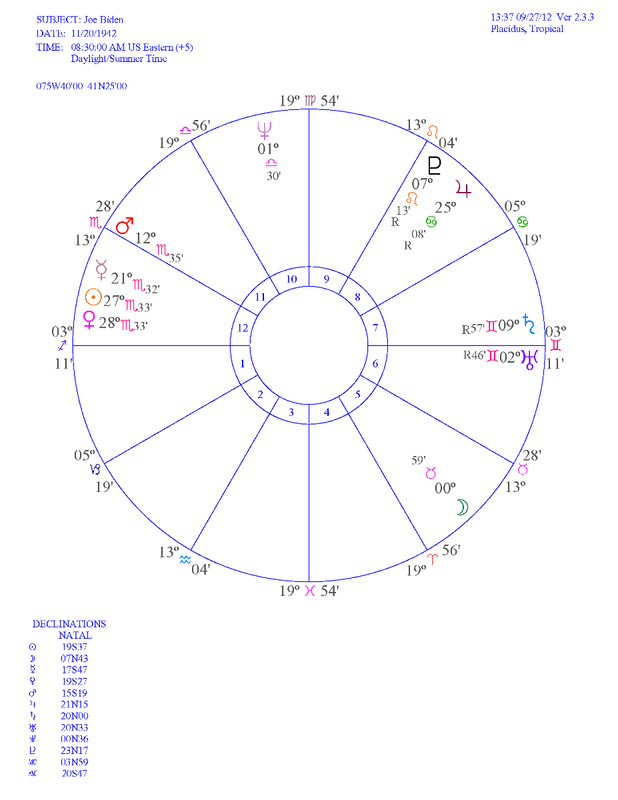 The Mercury-Sun sextile and progressed Mercury sextile birthchart Venus map opportunities influencing house 10 (his career) and progressed Uranus trine Neptune provides a lot of luck, but it’s the Mars-Neptune square aspect that maps the big obstacle he has to overcome. Only time will tell if he clears the hurdle.